Several media reports continue to misconstrue the meaning of “cavity collapse” and “chimney collapse” at the Punggye-ri nuclear test site, concluding either that the entire test site has collapsed or that radiation is leaking into the atmosphere as a result of the September 2017 nuclear test. However, neither a “cavity collapse” nor a “chimney collapse” equates to a test site collapse, as explained in a recent 38 North article. 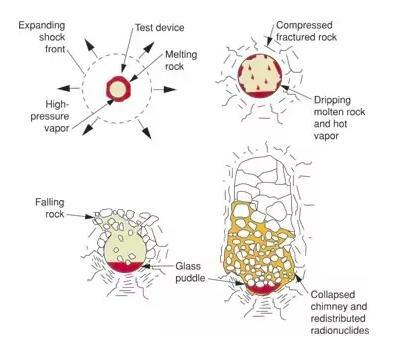 More importantly, neither type of collapse means that there are cracks or fissures all the way to the surface that would allow radioactive particles and gases to vent into the atmosphere. Instead, what this means is that the chamber where the test took place, under hundreds of meters of granitic rock and volcanic layers, has likely closed in after the explosion. And while this makes the chamber no longer usable, the damaged area is overburied and the damage is unlikely to have reached to the surface. – the chimney reaches the surface. This point is reiterated in well-crafted post by Bruce Tabor on Quora, which was written in response to a question raised about the first post-test tremor following the September 2017 test. A magnitude 4.1 aftershock occurred 8.5 minutes after the magnitude 6.3 earthquake caused by the explosion of North Korea’s hydrogen bomb. The media misreported this aftershock as a tunnel collapse, implying tunnels dug for testing purposes collapsed as a result of the test. In fact the aftershock was most probably a cavity collapse. A large underground explosion will melt and deform the surrounding rock and create a hole or cavity in the rock. For a 250 kiloton explosion that cavity will be about 200 metres across. That cavity will be surrounded by a zone of crushed rock about 3 times the diameter of the cavity itself. The roof of this cavity will usually collapse several minutes later, especially for large tests like the NK one. If the explosion is deep enough – deeper than 500–600 metres for a 250 kiloton blast, the collapse will not extend to the surface, i.e. there will be no subsidence at the surface. Figure 1. A nuclear test cavity collapse and subsequent chimney collapse sequence. Diagram presented by Bruce Tabor. In the case of the September 2017 test, the minimum depth of burial was at least 700 meters and likely very close to 800 meters, which is more than enough to safely contain that test with no leaks of radionuclides. Moreover, the Comprehensive Test Ban Treaty Organization has not detected or reported that there was any leaked radiation from that test. As we were about to go to press with this article, we became aware of another reference work that addresses the various issues surrounding the viability of Punggye-ri for additional nuclear testing here-in including the question of the so-called “Tired Mountain Syndrome” with regard to Mt. Mantap, and which provides additional corroborative background information. See for example: “North Korea test site could be unusable after collapse – Chinese scientists,” BBC News, April 25, 2018, http://www.bbc.com/news/world-asia-43894394.